Cognitive strategies in this framework were and still are designed as those learner’s actions that improve the efficiency of the learning process and the quality of results. Thus knowledge application and problem solving appear as metaknowledge on situational conditions and procedures (1st performance of cognitive strategies: learning strategies). The way we put the subject of cognitve strategies for consideration stress the difference of knowledge and cognitive acting. Actions emerge from decisions, the challenge of decision making emerges from cognitive intentions and endeavours. Cognition is knowledge in action. Cognitive strategies are the metacognitive routes, that guide cognition (2nd performance of cognitive strategies: cognitive organization strategies). The difference between both performances correspond to the difference that stired up the debate on lifelong learning. If the main objective is a lifelong further education in the sense of organized instruction the first performance seems to be the right way of teaching strategies. If the main objective is a lifelong self-directed learning of individuals, the second performance ought to be an additional claim on school learning. I stress that point: Not an alternative, but an additional one. The frames of both performances of cognitive strategy are of theoretical interest. From the frames we learn about the relations between psychological theory and their valid field. But: To discriminate between both performances raises some difficulties, because it is an essential theoretical demand within the first, that the root of the difference between content learning and cognitive acting is a difference of generality or inclusiveness. This is a misleading hypothesis, because it implicates a common base and tends to exclude principle differences. But actually there is a principle difference. Both performances are set up for different aim and purpose -(within the 1st perfomence: effective organization of knowledge/ within the 2nd performance: effective organization of problem solving). and link up to different consequences (within the 1st performance: elaboration of knowledge structure / within the 2nd performance: elaboration of spontanous problem-solving and decision). I am now going to pick up a hypothesis from the German psychological discussion on school learning and instruction, that postulates the context of learning strategies (or 1st performance). The higher general a rule, strategy or routine, that is: the more extensive the field of potentially useful application is, the less it contributes to solve a pretentious problem. „Pretentious problem“ is bound to a special kind of problem. In German it is „contentbound“. To approximate the exact English meaning it is helpful to outline the German special idea of an opposite meaning of „contentbound“ as it is included in the dualism of „material“ and „formal“ learning. „Material“ aims at the propositional content, „formal“ at the subjective equivalent that results from the process of learning and the material and structure of the learned content. In German tradition of educational science this is a highly explosive subject confronting holistic and rational ways of scientific thinking. Actually many teachers tend to a way of teaching that bias contents and prefer instructional methods giving support to meta-learning, that is learning how to learn. This tendency – but not yet reality in German schools – evoke critic from those educational experts, who stick to traditional concepts of school learning and give priority to the construction of well-organized, differentiated and rich knowledge. 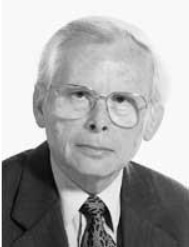 Franz E. Weinert, 1999. The higher general a rule, strategy or routine, that is: the more extensive the field of potentially useful application is, the less it contributes to solve a pretentious contentbound problem. The empirical work Weinert reports results from comparing experts and novices. Indead it is quite convincing, that students with little experience in mathematics or grammar of the Latin language cannot use strategies as successful as more experienced students do. We may conclude, that procedural and epistemic knowledge are complementary. But we may not conclude, that learners who share the same level of ability, are more successful with learning strategies in the sense of the 1st performance than with cognitive organization strategies in the sense of the 2nd performance. Weinert’s hypothesis enjoys a high citation rate and he himself repeats it in several publications. Experts of the educational system will pay attention to his advise. This expectation raises the question, whether teachers who are engaged in change of traditional instruction will abandon or revise or dogmatically defend their objectives. Researchers in the educational field often discuss their outcomes and develope their theories without sufficiently considering the teacher’s view. I don’t want researchers to join the view of teachers as it is proposed in special action research concepts, but researchers ought to enter the frames of teacher’s thinking for better translation of their advices into what works in the professional field. We can learn that from constructivism. In my concern: A habit of Teacher’s thinking is to consider their methods being alternatives: They confront content and strategy but fail to differentiate between learning and cognitive organizational strategies. Actually teachers know little about strategies. The first way to cope with the challenge of strategic learning is to refuse the objective. Teachers dominantly don’t like strategies. The average teacher draws his self-esteem from being good in his subjects. His concept of good teaching focusses on effectively organized lessons, evaluation of subjective dispositions and personal qualifications are excluded from school routine. The second way to cope is engaging in strategic learning and reducing on the other hand the systematically organized receptive learning of contents. Those teachers appraise strategies because they conceptualize strategic qualifications to turn the depreciation of knowledge in a rapidly changing social world to the student’s advantage. In practice this attitude contributes to a general loss of knowledge mostly without an edequate adjustment in strategic qualifications. Thus teachers understand Weinert’s hypothesis as support for content learning. I am afraid it will not conjountly incite their sympathy for learning strategies as Weinert has in mind. that the close relation between knowledge and metaknowledge does not relieve teachers of carefully differentiating between traditional instruction and routinizing the student’s disposition of strategic cognitive behaviour. Analytic philosophy of science conceptualizes thinking as problem solving. In case of subjective important problems the structure of spontaneous thinking is analogous with the structure of scientific procedures. This figure is labeled „Man as scientist“. Knowledge is an outcome of cognitive acting, the routes of thinking remain as parts of the knowledge material. So from this point of view our attention turns towards the questions, 1st how to discover the routes of thinking as an intrinsic constituent of the knowledge material and 2nd what are the didactic instruments and advantages we can draw from these characters of knowledge. The difference Weinert made between content-near and high inclusive knowledge or the traditional dualism of formal and material learning gets irrelevant from this point of view. Contents and cognitive acting are two aspects of the same thing. Dewey’s idea of school projects is an example how to draw consequences from this concept. Dewey explicitly advised teacher’s education to design instruction with respect to the dynamic aspect of knowledge, that is to the routes of thinking implied in knowledge. In the frame of actual psychology projects provide the opportunity of situated learning. But the analytic way of conceptualizing thinking dashes against theories of totality or holism as implied in critical theory. Though not articulated in a theoretical way teachers tend to holistic attitudes. This bias often twist psychological theory to its opposite meaning. So it does in the case of school projects. Teachers do not set out school projects to provide a chance of situated learning as an instrument of effective cognitive organization, but to support the students integrating of the learned contents in the subjective context of every day life. The reasons they give indicate the antirational roots of teacher’s pedagogy. School projects therefore mostly fail in the instrumental purpose Dewey had in mind. Kraak and I published since the late seventh several essays on cognitive organization strategy, which aim at bridging teacher’s attitudes and the demand of rational self-directed cognitive behaviour. The essence of our proposal is the coincidence of spontaneous problem solving and rational, that is scientific procedure. There is no need to intervene in emotional wants of the youngsters, to narrow their rich, coloured and exiting world to poor rational and abstract perception – as teachers are used to complain. It is just to have a look to how they actually think and what they actually do and help them to elaborate it. 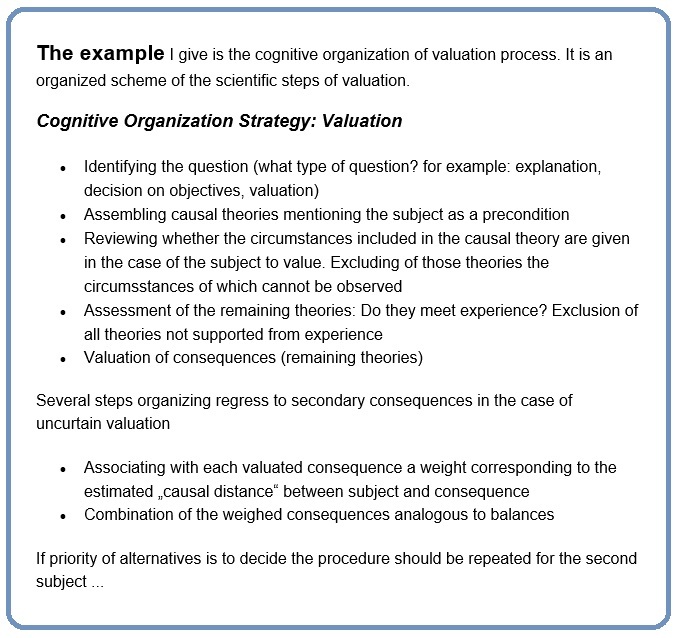 Cognitive organization strategies assemble several steps of a problem solving procedure, which as a whole characterize a special type of question. Dörner, who did much work on describing spontaneous thinking strategy, reports, that problem solver‘s performances point to typical breaks. For example at one of his most prominent examples, the Nil Delta problem, his students were disposed to focus their attention on their objectives, but to disregard those consequences, that occur out of the scope of intention. At the end of my paper I shall arrange the relations between my concern with cognitive strategies and the topics discussed in the educational field. The international debate on lifelong learning polarizes lifelong self-directed learning and lifelong education. Learning strategies and metaknowledge in this frame belong to lifelong education; it is a topic of organized instruction and systematically structured curriculum. Metacognition in the sense of organization of cognitive action belongs to lifelong learning. It claims on the individual initiative and the person‘s competence to decide what and how and where to learn. In a similar way the international debate on vocational education polarizes special vocational education and general vocational attitudes and abilities. Big enterprises as Siemens have developed an informal way of further learning allowing employees to learn while they are busy at their job: Employees who feel they detected a problem start their computer, draw information from an expert system and try to solve their problem. As the promoters of lifelong learning do Siemens claims on the individual‘s initiative and the person’s competence to decide what and how and where to learn. It is this competence we have to build up in schools. Nevertheless it remains true, that students have to learn contents and that they have to learn how to learn. Education is not the field of alternatives but of complementarity.